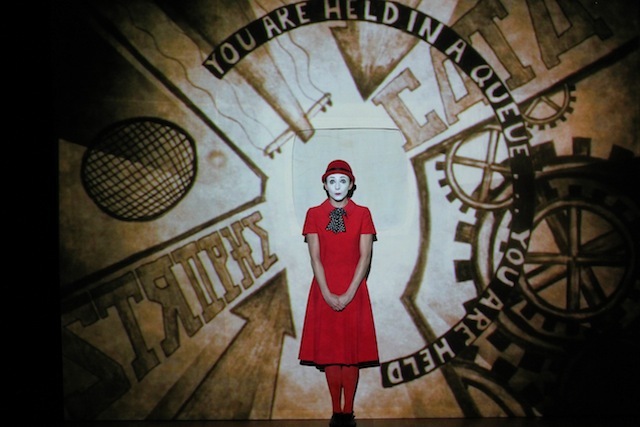 4 years after its debut at the Battersea Arts Centre, 1927‘s award winning The Animals and Children Took to the Streets sets up home at the National for the upcoming weekend. Situated in the run down quarters of the notorious Bayou, residents face a growing epidemic of troublesome youngsters running amok and aspirational futures being as dispensable as the cockroaches that live alongside the community. Suzanne Andrade, Esme Appleton and Sue Appleby superbly narrate a story of Pied Piper proportions. A contemporary tale of class, revolution, the youthful generation vs the older generation and politics, the production wildly and wickedly saunters between leopard print clad residents, to comical Jack Dee-esque musings of the caretaker. Andrade’s omniscient Mrs E. Villycar amuses as the sharp tongued, unsympathetic centre piece of the Leopard Print brigade. Andrade’s comic timing makes for a compelling watch as she slickly switches from a gossiping busy body to the shrinking violet caretaker, voiced by James Addie. Reduced to a series of continual anecdotal thought processes, Addie’s plain one liners, paired up with Andrade’s wild haired, dungarees wearing caretaker make for a winning combination. Esme Appleton’s Agnes Eaves embodies a sense of innocence in a world full of eccentricity as she attempts to make sense of her new neighbourhood. The angelic influence almost powerful enough to summon a sentence from the caretaker delights as the production’s heroine who is intent on doing good for both her daughter and the greater good. Appleton’s Zelda, a rebellious youngster is the antithesis of Agnes. Inspired by the concept of revolution, Zelda mischievously travels around the Bayou wreaking havoc wherever she can. Sue Appleby’s cabaret infused piano sequences provide a vintage soundtrack of the playful, the mesmerising and the outrageous. Lilian Henley‘s jovial compositions, the light hearted musical language in which the narrative takes form. The seemingly minimalistic staging, consisting of 3 projectors, shape shift into a world of the wonderful and the whimsical. Paul Barritt‘s animated-topia pans from sepia stained tower blocks, to the charismatic underbelly of Red Herring Street. Silhouetted figures run riot whilst dream worlds perplex. The interactivity of the animations create a stand out piece of theatre, each new scene, a new page turned in the ever eventful storybook. Motion Capture Artist and Stage Combat performer Jessica White speaks to Theatrefullstop about starring in Hiraeth Productions' Hamlet! Physical Theatre performer Jessica Andrade speaks to Theatrefullstop about starring in the Tangled Feet production, One Million!